Probably not the case for most people but it kinda worked for me! 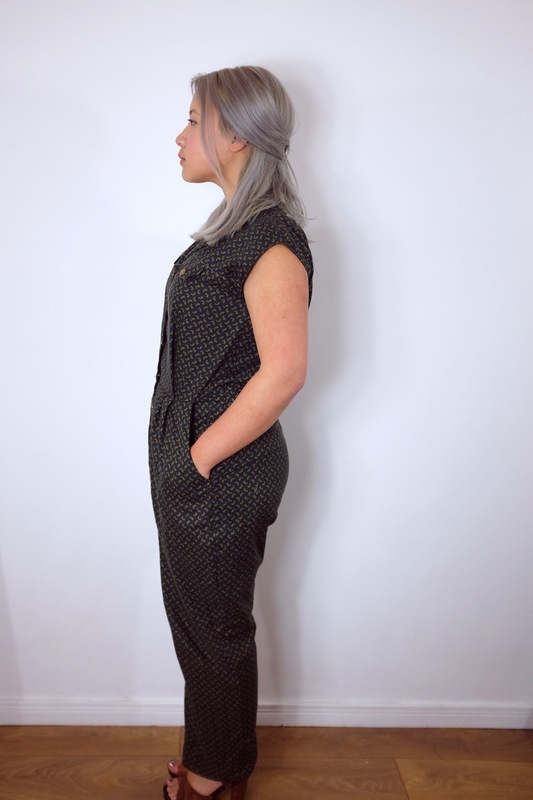 I finally got round to using my Dominique jumpsuit pattern from République du Chiffon. I must’ve bought it well over 6 months ago! I loved the design but after using the Josie pattern, I wasn’t very keen to get into another RdC pattern. That being said, I think this jumpsuit turned out much better than my Josie dress! 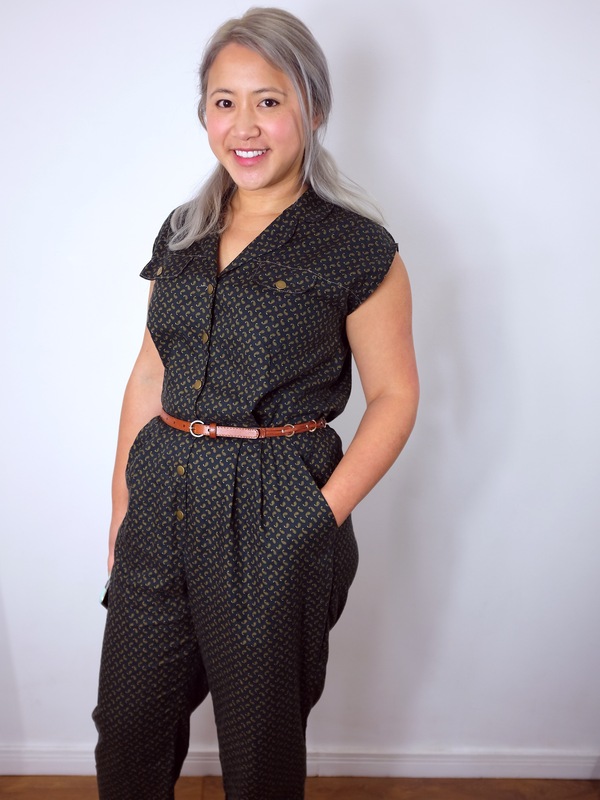 So the Dominique jumpsuit has a simple peg leg shape with pleats on the front and back, faux pocket flaps on the front shirt and a dropped shoulder instead of sleeves. You can choose to close it with either snaps or buttons. My biggest concern with this pattern was whether my chunky thighs would fit into them! I ended up grading out 2 sizes through the hip and leg and extended the back crotch further by 3 cm. this was all a bit of guesswork based on trousers I’ve made before and measuring the pattern pieces themselves. I’m glad I made all those adjustments though otherwise it definitely would’ve been too small! I used a lovely dark grey paisley print cotton that I got in Singapore for this. I only just about managed to get the pattern onto the 3 yards of fabric that I had! It was pretty quick getting everything together. I was pleasantly surprised at how easy it was! I thought I might’ve had to take some length out at the waist – I was prepared for that – but when I tried it on, it fit pretty well! I finished it off with metal snap closures down the front. All in all, it was a pretty successful make! I think the arm openings are a little tight on me – I’ve got chunky upper arms – so I might open that up a little if I find it uncomfortable over time. And maybe taper in the leg slightly. It’s pretty funky though! I just can’t decide what the appropriate shoe to wear with it is. It’s very disconcerting because I have a lot of shoes so there’s usually something that’ll work but I don’t know what it is! Looks great and comfy! I really like the understated paisley print. Very nice! I agree with you in styling with the belt, beautiful! I also have to agree with Cathy…that’s the only reason I don’t own a jumpsuit too! I LOVE this! So sharp. Fab jumpsuit, looks great on. Looks great. I know what you mean about the shoes? I haven’t worn a jumpsuit since my light pink one dropped to the floor in a ladies and ended up wet! Late to the party but I have just made this fab jumpsuit. No alterations needed thankfully, and if there had been it would have been part guesswork as the construction makes it difficult. The legs were too short and really an odd shape, which I had to retest with the pattern pieces after construction. The back leg piece was shaped with curves where there weren’t any on the front leg so when I stitched them together it was a bit wonky. Also found the armholes wouldn’t hem nicely, perhaps I should have sewn them prior to sewing the outer seams? Other than that it looks great.